Previously, our contributor Charlton Stanley wrote about Kanawha County Prosecuting Attorney Mark Plants in a controversial foreclosure matter. Now, Plants is back in the news as the subject of a criminal case as opposed to the charging prosecutor. Plants is charged with beating his son with a belt and leaving a considerable bruise. He is claiming a constitutional right to such beatings as a parental choice on discipline. 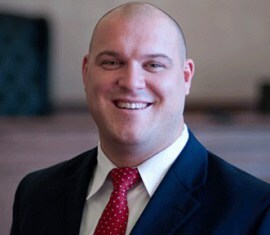 Plants, the elected Republican prosecutor for the county, was charged with the beating after his ex-wife found a 6- to 7-inch bruise left by a leather belt. She says that Plants used the belt roughly ten times on the 11-year-old boy after he shoved his stepbrother off a scooter. Plants is now married to his former secretary — a relationship that has previously caused concerns over favoritism in raises and ticket dismissals. Some four days after the beating, the boy still have a large bruise on his thigh. Plants, 37, insists that he only struck the boy twice for no more than 20 seconds. Plants is 6 feet 2 inches tall and weighs 280 pounds and played as a fullback on West Virginia University football team. Plants has two sons with Allison Plants and a child with his new wife, Sarah Foster. Allison Plants was granted an emergency domestic-violence protection order by Kanawha Family Court Judge Mike Kelly in February. Plants was charged in March with violating the DVP order. Both misdemeanor charges he faces carry a penalty of up to a year in prison. Clearly, there are limits to a parent’s use of forms of physical punishment in drawing a line between parental discretion and child abuse. However, Plants could raises a difficult question. While child rearing experts have almost uniformly denounced spankings and beatings as punishments, many parents continue to use such punishment and neither society nor the courts) have found such discipline is by definition abuse. For example, use of a spoon to beat a child was not found to be abuse. Some states are moving to codify the level of permitted spankings. We have been politicians and judges caught up in this debate. Indeed, one judge actually ordered spanking in his courtroom while another chose to spank inmates in his chambers. Yet, we have seen these cases continue to be brought including one involving a mother on an airplane. 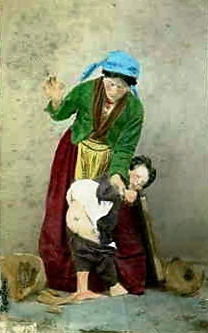 In the wooden spoon case, the California court stressed that there was no intention to leave a bruise and that “the spanking was entirely the product of a genuine and deliberate disciplinary purpose, i.e., to arrest troubling behavior patterns exhibited by the daughter.” It is a parental practice that has been around for centuries. Growing up, my father would occasionally spank me or my four siblings. However, he would only use his bare hand and never use any belt or object. He had been abused as a child and he did not like spanking. He would quit as soon as we cried and apologized (which I often did on my way to the table to cut to the redemption stage more quickly). I did not view it as abusive and it was rarely done in my house. Notably, while I do not entirely reject spanking, I have yet to spank any one of my four kids. I have never found it necessary, particularly with the far more severe punishment of denying electronics. My kids would accept the rack before the loss of the Wii or XBox. I have to admit that I was particularly disturbed by the account of the boy in the Plants case that he was brought in front of his stepbrother who was asked if he was spanked enough. Yet, I would not argue that that is abusive. I just view it as a remarkably poor choice of a parent if it did in fact occur. The legal question is more straightforward (though hardly easy). It is a question of degree since it is doubtful that the court would declare any and all spanking to be abuse. That leaves a rather tough question of line drawing. Any switch or belt or spoon is likely to leave a bruise. Spanking is supposed to cause physical pain. That is why many experts view it as brutal and counterproductive. If there is no evidence that Plants’ broke the skin and the examination found a single bruise, should the court dismiss the case in your view? The problem that I foresee is that the court would have to rule on the record as it exists now — without expert or live testimony. It seems to me that a large bruise can reflect excessive force (particularly days later). The court would need to have a good idea about the level of force that would leave such a mark even if the court accepted that some spanking is permissible. @ David, just found this article, cut and pasted here about a new study on corporal punishment and thought I’d share it with you, not because I think I can change your mind on this! In Holden’s study, “the average rate we observed using the real-time audio equates to an alarming 18 times a week,” which would put the average number of spankings per year at 936. Something seemed awful fishy about this story. I probably have not received more than 18 spankings in my entire lifetime, and I doubt that I have given more than 18 spankings for each of my five children throughout their entire lifetime. Yet this study was reporting an average 4 year old is spanked 18 times a week for a total of 936 spankings a year? Unbelieveable. This clearly was not a carefully designed study to test the value of spanking. It was a preliminary study carried out over only 6 nights that involved only 41 incidents of corporal punishment within 15 families. The purpose was only to see if audio recordings might be helpful in conducting a study about the effectiveness of spanking. Yet look at all the wild reports claiming how this study proves that spanking doesn’t work and that those who spank their children will spank them 18 times a week. Truly unbelievable. Please do not believe this malarky. David, who is to say you would have turned out the way you are without your father belting you and that your own children would have been the same adults without your belting them. Time-outs are more cruel to you than spanking from a psychological perspective? I must have missed the psychology class which did research on that and came to this conclusion. Perhaps you meant to say it’s from your very own psychological perspective? Your father was greatly respected by you and many others; good for him. I bet he didn’t belt anyone outside his own family though. Most of my friends and (yes, I do have a lot of friends) were never ever belted and are very successful, fun, intelligent and caring human beings. And, BTW,abused children often really love their parents. Cheers. At least one of you commenting on this story say that spankings straightened you out. 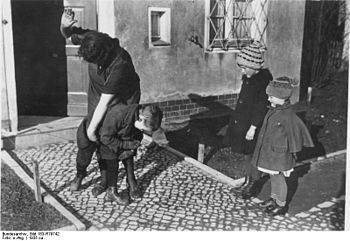 We’re NOT talking about a spanking here; this young boy was beaten with a belt and that is plainly and simply child abuse. What was the secretary of this brute thinking when she married that miserable heap of meat? I bet you she will be at the other end of his hand or belt one of these years. Paul Shulte, what the heck is wrong with you that you had to use the belt on a child? I am both a mother and have been a public school teacher for 25 years and I always managed misbehaving children with simple time-outs and taking away privileges. I was beaten black and blue by my macho, conservative and bigoted father several times that mom had to keep me home feigning to the school authorities I was ill. I see my father for two hours a year and even that is too much. It wasn’t so much the belting as it was that I found my father to be a loser. Sorry to hear that your father was such a loser. Not every father who uses a belt is a loser. My father used a belt on me when I was young. Often it would leave temporary marks when he had me pull my pants down to expose bare skin. I never missed a day of school because of it. It was all good. I have always greatly loved and respected my father. In contrast to your experience, I loved spending time with him. He was the greatest and most righteous man I have ever known. He passed away in 2003. I could not say enough good things about him at his funeral which was attended by hundreds of people, many that I had never met whose lives were touched by him. I tried time-outs a few times with my children, but I considered that to be more cruel than spanking from a psychological perspective. And he’s charged with enforcing the laws…. RightO…..
What Kraaken said. Parents have a right to spank their children and that act of discipline should not be criminalized. Never trust an article that refers to someone giving a child a spanking as “beating” a child. If the 11 year old winds up shooting his sadistic goon of a father, I won’t be surprised. Or sorry. Lets see what do we know about this guy. He leaves his wife for his secretary. He beats his children with a belt. He breaks court orders against domestic violence. Yep, he must be a Republican Prosecutor because he is still in office! One does not have a constituional right to break a court order. This guy needs to be disbarred yet he is making decisions on who to charge and how to charge. Ridiculous. Unfortunately, his “manly” behavior has probably gotten him some street cred in WVA. I agree with Sierra Rose’s comment up there a ways. But, does this guy shave his head? It looks like it. Don’t trust anyone who shaves the head.